The Turku recording studio of YLE, the finnish Broadcasting Company, was the playground repeatedly in 1965 - 1966. Several recordings were made for the company. Unfortunately, all the old tapes were either rerecorded or have been destroyed. - Swedish Hep Stars visited finnish television in "Ohimennen" tv-show with us, also recorded in the Concert Hall of Turku. 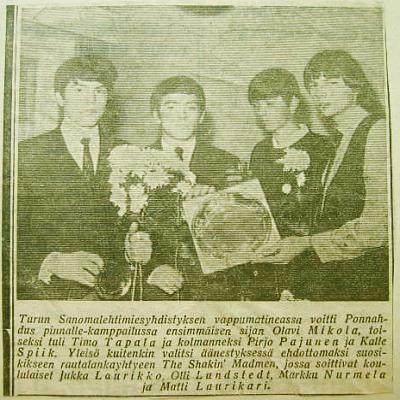 A memory above others occured in 1965, when Rolling Stones visited Yyteri in Pori. They stayed in Hotel Hospits in Turku. 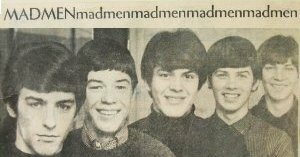 When drummer Jooseppi of Madmen was passing the head postal office in Turku with his VW, all the sudden Bill Wyman jumped in the car. He was out for cicarettes, and needed a short rescue from the fans! For the first time in the headlines after "Ponnahdus Pinnalle" (A Bounce to Fame), spring 1965. The succes was enormous. You could tell that from our faces, huh? Our top score in the number one magazine of pop youngsters. !